Adil Nabi (right) has been impressive in training for Posh. Manager Graham Westley believes the buzz is back at Peterborough United. Westley has conceded the League One play-offs are out of reach of his young squad, but he’s still excited about the rest of the season, starting with tomorrow’s (March 12) clash with Port Vale at the ABAX Stadium. Lee Angol could be back for Posh against Port Vale. An encouraging 1-1 draw at promotion favourites Wigan last weekend (March 5) has lifted the gloom caused by five straight defeats, but Posh still find themselves way off the pace at the top. They are 16th, 10 points behind the top six and 10 points clear of the bottom four, ahead of tomorrow’s clash with a Vale team in excellent form. Westley said: “I’ve not been overly-concerned by the results or the peformances of late. 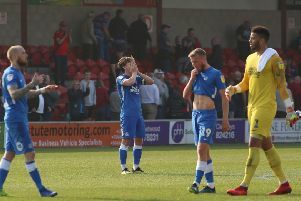 I completely understand why we have had such a muddled period, There have been a lot of younger players still trying to find out what it means to be a Peterborough United player. “But this is still a very exciting place to be. There is so much ambition at the top and so much knowhow from the likes of Barry Fry. I had a long meeting with the chairman and Barry recently when we discussed the next phase of this club’s development and how we are going to progress during my tenure here. “We are all confident of success. We are all confident that we will cure our current ills and emerge stronger for it. “We have a very ambitious squad of players. They all want to success and they all want to learn. They all work hard and I have sensed this week that form and confidence has returned, helped no doubt by last weekend’s result. “I’ve been patient and tolerant with them while they find their Peterborough United feet. Take Adil Nabi for instance. He has been playing foortball from heaven in training. He’s taken on board the advice he’s been give and he’s benefiting from it. “There has been a buzz about the training ground this week. Of course you can train as well as you want, but performing at 3pm on a Saturday is what really matters. “We have big players coming back so I’m excited about the next few games. Key midfielder Chris Forrester and striker Lee Angol returrned to training after yesterday (March 10) and could be in the Posh squad. Midfielder Martin Samuelsen and goalkeeper Ben Alnwick are not expected to be involved.